Summer&apos;s almost over and it&apos;s time to #VisitWilm and soak up the last of the season&apos;s offerings! It&apos;s going to be a great weekend in Wilmington, Delaware and the Brandywine Valley! Here are our picks for your weekend itinerary – and don’t forget to share your travel pictures using #VisitWilm on Instagram & Twitter! 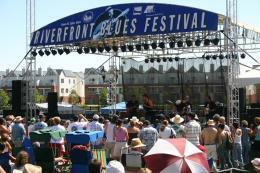 The 2017 Riverfront Blues Festival is a 3-day, outdoor festival, held at Tubman-Garrett Riverfront Park on the Wilmington Riverfront. This music-lover&apos;s paradise, which has been held for 20 years, is a rain or shine event, featuring both national and local acts. Performances include Lil Ed & The Blues Imperials, Kenny Neal & His Family Band, Lower Case Blues, Joe Louis Walker and many more! Performances start at 5 p.m. on Friday, Noon on Saturday, and 12:30 p.m. on Sunday. Tickets are $35 for a day pass, or $90 for the weekend. Advance purchase for weekend pass tickets is required. Don&apos;t Miss First State Flea Market at Glasgow Park! Happening the first Saturday of each month, the First State Flea is a market with multiple vendors of antiques, vintage items, repurposed furnishings and handcrafted goods. Unique treasures, lots of fun and something for everyone! Flea Market hours are 9am - 3pm. 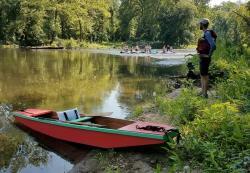 Join Dylan Gauthier, artist-in-residence at the Brandywine Conservancy & Museum of Art, for an interpretive, scenic, and sonic canoe trip along the beautiful Brandywine River. This 12-mile, participatory canoe voyage begins in the historic district of Northbrook, PA, and ends at the Brandywine River Museum. The tall willows, rocky banks, and thick meadows that stretch along the rolling Brandywine provide a sonic backdrop for a four-hour sound piece on the region’s cultural and natural history, composed by the artist and broadcast on provided radios along the trip. Naturalists from the Brandywine Conservancy will provide commentary on the flora, fauna, and history of the region along the way. Cost including canoe rental is $34/person or $68/canoe. If you plan to bring your own canoe, the cost is $20 per person. Trip begins at 11:30am. 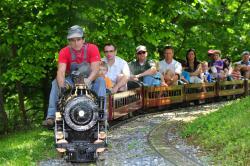 During Steamin’ Days at Auburn Heights, the site truly comes alive. Visitors are encouraged to climb into an antique automobile or board one of our trains and experience what it was like to travel at the turn of the 20th century. Tour the magnificent 1897 mansion that was home to three generations of the Marshall family, or the Marshall Steam Museum, featuring the world’s largest operating collection of Stanley steam cars. There is something for everyone at Auburn Heights, whether you are 2 or 92. General Admission includes 4 rides in the antique autos or Auburn Valley Railroad: $11 ages 13 and up, $8 ages 12 and under (infants free). Mansion Ticket includes tour of two floors of Auburn Heights: $12 ages 13 and up, $6 ages 12 and under (infants free). Combo Ticket covers it all, rides and mansion: $19 ages 13 and up, $12 ages 12 and under (infants free).